Jim Poor at the Heritage Wall in 2011 when the PCPH Plaque was installed. It has often been said that an organization is not a building or a book of rules, but that it is made of up of the people who make it a going concern. In the case of Putnam County Playhouse, one of those people was James H. Poor. 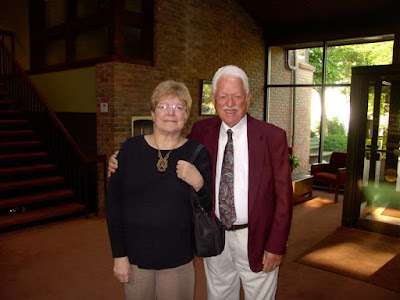 Jim first came to PCPH when it was known as Greencastle Summer Theatre. One of his first roles was in the comedy Sabrina Fair. He also appeared in Come Blow Your Horn, The Silver Whistle, and the musical Little Mary Sunshine. His enthusiasm reached far beyond just appearing in a variety of roles. 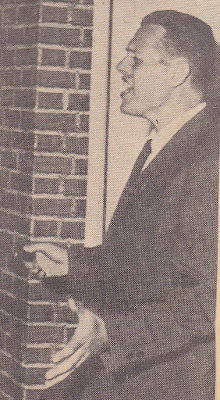 He became active as a member of the board of directors when we were incorporated as Putnam County Playhouse. Jim served on several committees and served several terms as President of the Board. He was tireless in his efforts to make PCPH a going concern! Jim and some cast members in "The Sound of Music"
One of his first directing assignments was the musical The Sound of Music. When Jim recognized that there were many more children wanting to be in the show than he had parts for, he began his series of Children's Productions. These would include Pinocchio, The Wizard of Oz, and Peter Pan and many others. 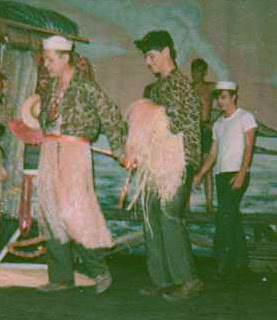 Jim (left) as Luther Billis in "South Pacific." One of Jim's most famous portrayals onstage was as Luther Billis in South Pacific, a role he played twice. He also played The King in The King and I three times and Alfred Doolittle in My Fair Lady twice. "I have Jim Poor to thank for making me the theater lover I am today. He started it all in 1967 when he cast me as Snow White. Our special friendship continued to grow over these last fifty years. Jim was the epitome of Putnam County Playhouse and set the foundation of my theater career." Jim and Adeline Knoy recreating a "Hello, Dolly!" 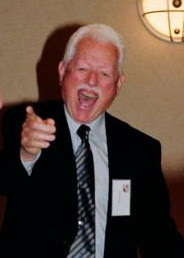 moment in a 1990 fundraiser. As the 1970's came to a close, PCPH was struggling financially. Jim was the person who spearheaded the move to find us a permanent home. He was instrumental in speaking to Hazel Day Longden and encouraging her and her family to give PCPH the barn and property where our theatre now stands. Without his steadfast and strong guidance, PCPH might not have survived those turbulent years. Jim standing on the south side of what is now the Hazel Day Longden Theatre. For the first two seasons on the property, shows were produced on an outdoor stage. The audience sat on bleachers. Only one show in all of 32 performances during those two years (1981, 1982) was rained out. Jim directed several of those productions including You're a Good Man, Charlie Brown, Pinocchio and Mary, Mary. Jim in the small ready to assemble the bleachers. Jim made many of the curtain speeches during those productions. His enthusiasm for PCPH and the new theatre was infectious! Within two years, enough money was raised to make the dream come true. 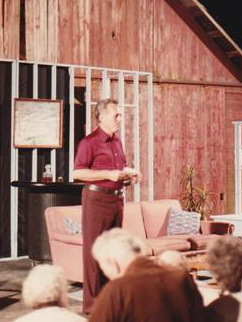 Jim giving the curtain speech during "Mary, Mary" in September, 1982. 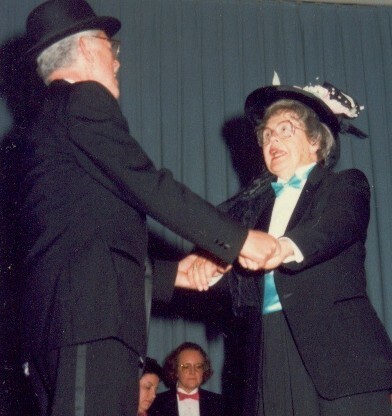 It all came to fruition on June 4, 1983 when Hazel Day Longden cut the ribbon to open the theatre that was named after her. A grand opening dinner and entertainment celebration was held later that same day. 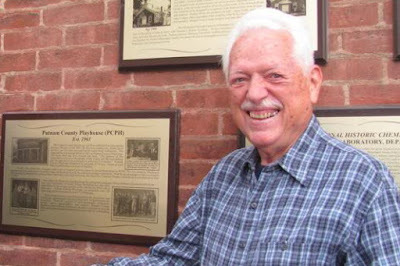 "Jim Poor is the reason Putnam County Playhouse exists. He wrote the by-laws for the organization. 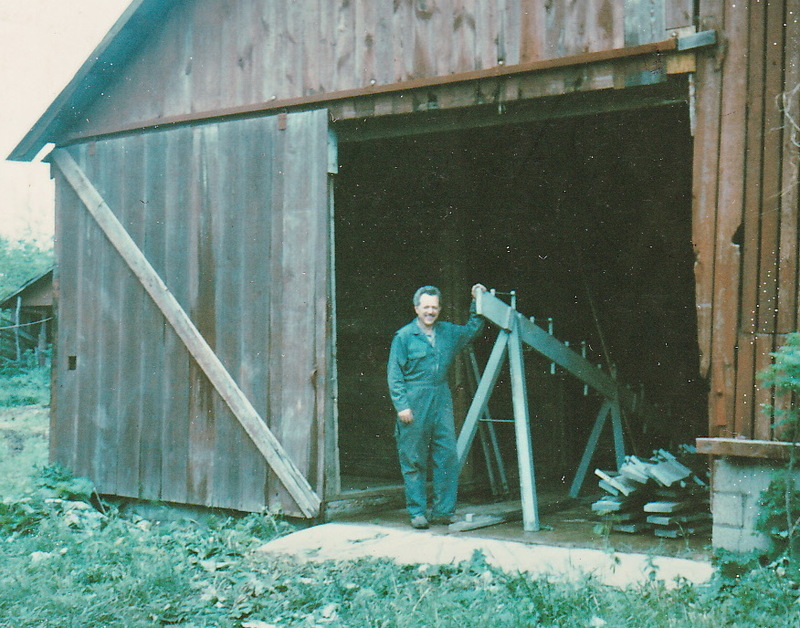 He 'discovered' the barn, initiated and completed the conversion to a theatre. He promoted excellence and creativity. He enjoyed bringing a production to life and presenting it to the community. He encouraged talented people to participate. His vision guides the Playhouse to this day. "As a mentor and friend he has influenced my life in ways too numerous to list. I did especially enjoy collaborating with him on sets. He was the builder with big ideas and I painted for him. He will be fondly remembered." "Working with Jim was always an adventure and an education. He directed me in some of my favorite roles including Prisoner of Second Avenue and The Sunshine Boys. Working with him was a master class in theatre. He taught me so much about the technical side of directing and also about the personal side of dealing with all of the different personalities involved in putting on a show. The audience always came first with Jim - he wanted them to have a good show. He was always completely honest in his appraisals of my shows. I knew if he said it was 'good', it WAS good!" Jim enthusiastically took part in all of the festivities surrounding the 50th Anniversary of PCPH in 2011. 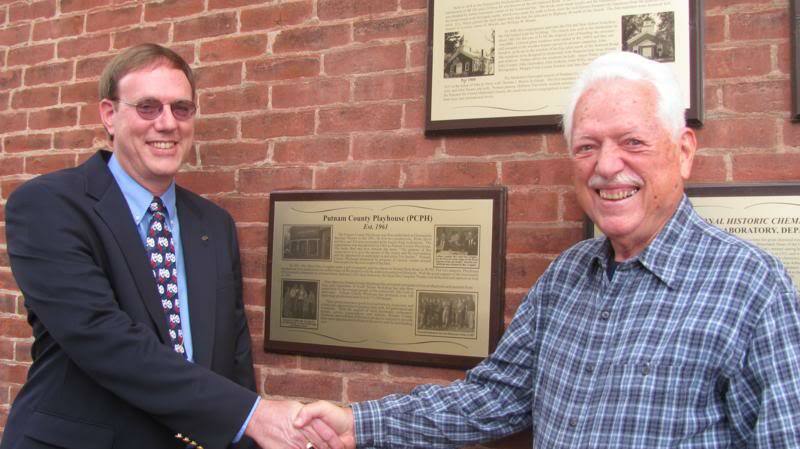 He and PCPH President Michael McClaine both spoke when the PCPH plaque was affixed to the Heritage Wall. 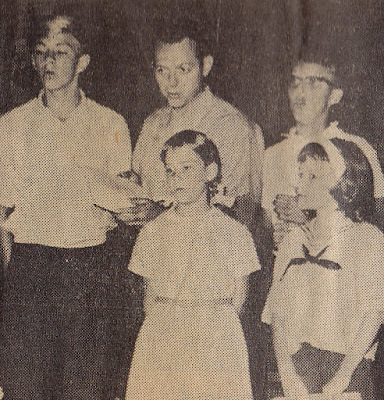 In the decades since we moved to "the property", Jim continued to work with the board and onstage and offstage. He directed many fondly remembered productions including The Crucible, The Glass Menagerie (featuring wife Emily as Amanda), Carousel, The Sunshine Boys, HMS Pinafore, and A Streetcar Named Desire among many others. 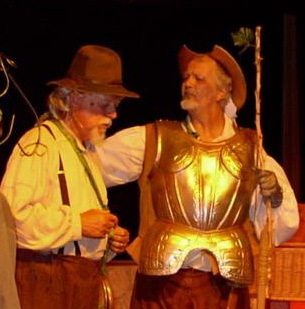 Among his more recent onstage roles were Sancho Panza in Man of La Mancha and Arvide Abernathy in Guys & Dolls (his final PCPH role). Jim, we will miss you. We appreciate you and all the hard work you did to make it possible for PCPH to continue to be the organization it is today. Memorial details can be read HERE.